Beverley in WW1 uniform, with Jeff Watson, Chairman of Amble and Warkworth Royal British Legion, with ‘Reg’ the trench organ. 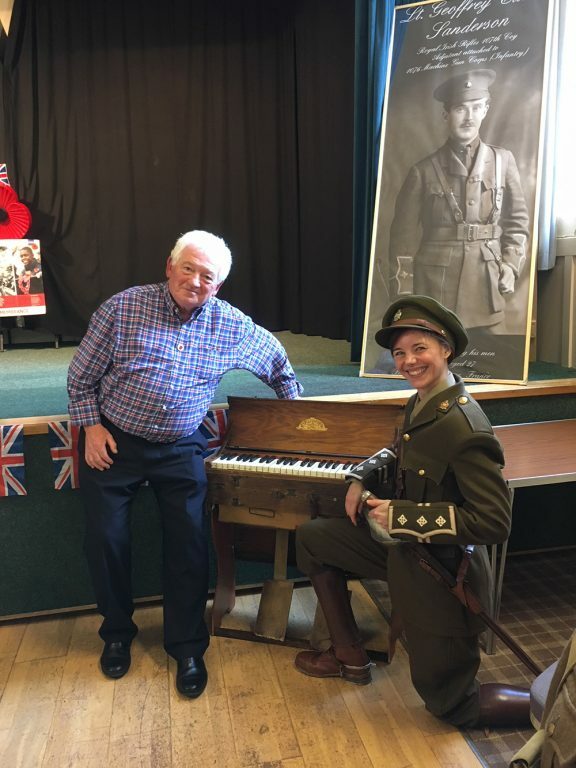 Amble organist Beverley Palin has been much in the news lately after her WW1 trench organ was used in re-enactments to commemorate the end of the war. Beverley told us the story of how she came to acquire the trench organ that she has nicknamed “Reg”, and her efforts to restore it back to former glory. “I acquired the organ in a bric-a-brac shop in Lyme Regis about thirteen years ago while I was on holiday. It was sold to me as a folding portable missionary or ships’ organ but had come in with no provenance. I hardly looked at it before I decided that for £45 it was worth a punt for a bit of fun, put it in the back of the car and there it stayed till I got home. “On getting it out when I returned, I found it was crawling with woodworm and the two side legs crumbled to powder- however enough was left for me to take a pattern and replicate them with a bit of marine ply from the shed. “It spent the next week in my parents’ garden with Dad spraying it with woodworm killer until I was certain the bugs were gone. Then we started to check the damage over. Most of it was salvageable with a bit of wood filler to stabilise it. My main intention was to have a reliable working instrument. “I replaced some missing screws and the perished leather straps for the lid (the leather salvaged by a friend from a Bentley being reupholstered!) and other than cleaning and oiling, it was in good condition and remarkably still in tune. “I didn’t discover the military connection until about two years ago – these small portable organs were issued to the chaplaincy to accompany services, although similar instruments were common until the 1950s.